Tacked to the walls of the Brooklyn Public Library's Central Branch are pictures from 34 artists who call the borough home. They draw inspiration from subway rides, cityscapes and their different ethnic backgrounds. On view through Jan. 23 at the Brooklyn Public Library's Central Branch (10 Grand Army Plaza, 718-230-2100). The children's author Eva Ibbotson died on Wednesday at the age of 85 at her home in Newcastle, it has been confirmed. She was best known for the Amazon adventure tale Journey to the River Sea, winner of the Nestlé children's gold award and shortlisted for the Carnegie medal, and for her funny, magical stories for younger children, including The Secret of Platform 13 and The Great Ghost Rescue. A wonderfully timeless children's novel, in the classic tradition. ...in which he tells us that the book he is proudest of is The This Exectioner - "it's the one I poured more of myself into than normal". HarperCollins Children's Books has acquired a the first title in a paranormal new young adult series by debut novelist Kiersten White. Publishing director Rachel Denwood bought UK and Commonwealth rights excluding Canada for Paranormalcy from HarperCollins US. Children's author Judy Blume has written a script for Tiger Eyes, turning her YA novel into a feature film. Her son Lawrence co-wrote the screenplay and will direct the film. According to The Hollywood Reporter, Tiger Eyes will be the first time a Blume title has been adapted into a feature film. Luka and the Fire of Life zings along with a palpable sense of Otter-like excess: its exuberance is inextricably linked to its profligacy with puns, rhymes, one-liners and snippets of nonsense. And although one would be amazed at the prodigious child who could follow to the letter its snaky progress, it captures brilliantly that moment when adults enrapture children by behaving like children themselves. Inspired by the enthusiasm of the young critics who last week helped critique and judge the Guardian children's fiction prize, The Guardian is in the early stages of creating a dedicated book site where younger readers can review and discuss the books and authors they enjoy reading. THE Wombles are back and should surely be doing a big team ner, ner, ner-ner, nerrrr. Because the furry litter-pickers from Wimbledon Common were sticking up for the environment at least 30 years before people began worrying about it. Their green message has been spread by creator Elisabeth Beresford in her much-loved Sixties children's books and Seventies TV adaptations. Now a new generation can enjoy the books, which are being republished from November 1 (£5.99, Bloomsbury). Scottish Book Trust is delighted to announce that Alison Murray, creator of Apple Pie ABC, has been named as the organisation's first Early Years Writer in Residence. The residency is the latest collaboration between Scottish Book Trust and Home-Start, the UK's leading family support charity. The two organisations have been working in partnership in the last 18 months on a number of projects benefitting families supported by local Home-Start Schemes across Scotland. The majority of Home-Start support is carried out in the family's own home, with home-visiting volunteers offering emotional and practical support to families, but many Home-Starts run family groups as well. Over the next nine months, Alison will work with the Home-Start Family group in Renfrewshire, in an area of socio-economic deprivation, to create a picture book which will potentially be produced in partnership with Orchard books and distributed in a Scottish Book Trust Early Years book gifting bag to 60,000 young children across Scotland in 2012. The aim of the project is to support parents' reading and writing skills and embed a love of book sharing with young children within the community. Commenting on her appointment, Alison said: "I am really excited about this project not only because it promotes a love of picture books and literacy, but also because it supports a community-centric approach to looking after our children and bringing out the best in them. I'm finding it hugely challenging but also incredibly rewarding. The best bit so far has been watching the parents in the writing group discover how creative they already are." DreamWorks has announced, via Deadline, that Spielberg's new film War Horse will be released December 28 2011, just five days after his motion-capture film The Adventures of Tin Tin hits theaters. The studio said that after screening War Horse, the story of a boy who enlists in World War I to track down his beloved horse, it felt "like a holiday movie." 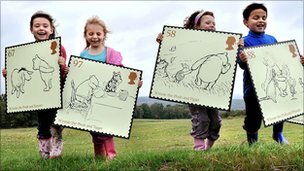 Black-and-white illustrations from the Winnie the Pooh books are featured on a new set of stamps. The 10 commemorative stamps show the honey-loving bear, Christopher Robin, Eeyore and other AA Milne creations. Megan Larkin, currently Fiction Director of Usborne, is to take up her new position as Publishing Director of Orchard Books in January 2011. Larkin was previously with Orchard Books until 2002. 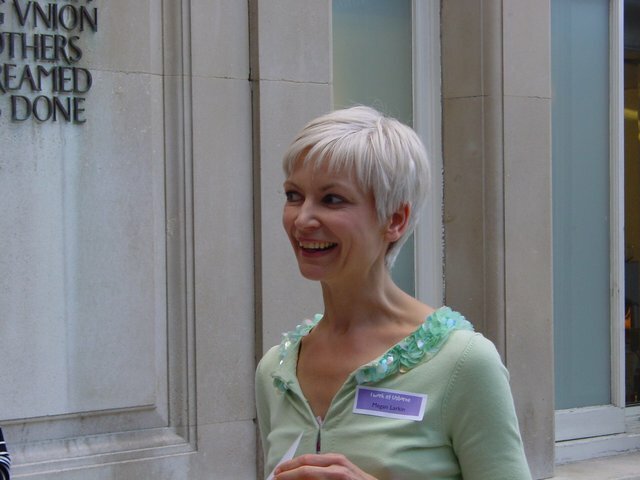 Since leaving Orchard Books Larkin has spearheaded the fiction list at Usborne in her role as Fiction Director. "Setting up a brand new fiction list for Usborne was a once in a lifetime opportunity; it's been an amazing experience and almost a decade later I'm immensely proud of what we've achieved. But returning to Orchard feels like going home. It's been very satisfying seeing some of the projects I commissioned becoming their biggest and most enduring successes, and I'm thrilled to be returning to such a wonderful list. I'm looking forward to working with their hugely talented team to take Orchard on to even greater success." with "A Personal Note on Puffin by Andrea"
I have the fondest memories of those first Puffins. I was seven when they were first published and remember them vividly. Of course the family, like many many others, had a copy of Aircraft Recognition (a Penguin), but we also had the War in the Air series. Suddenly my "book money" went a great deal further. Our father gave us, every payday, not only our pocket money, but also a trip to a bookshop in St. Vincent's Street in Glasgow where he would pay for our choice of book, or books, up to a certain sum- thank you Puffin. Looking through the excellent Puffin by Design, published to celebrate those 70 years, I found well-loved cover by well-loved cover. There was a book on armour, Hodge's Columbus Sails, Roger Lancelyn Green's King Arthur, Lucy Fitch Perkins' The Cave Twins, Patricia Lynch, Worzel Gummidge, Clarke Hutton. There were titles that I remember adding to the small class collection of tales to share with my students. Puffin has and had made an enormous contribution not only to the pleasure of children, but also their literacy. Many a family could now buy a book for a child when they could never have afforded it before, and there is nothing, as a wise elderly Professor of English Education told us, nothing as valuable to a young reader as being able to reach down from a shelf their very own copy of a well-loved book. This is a new annual award honouring two jury-selected books, in the categories of adult and young reader, published in the field of science and written by a Canadian. "There's this whole thing of being two people. You are the person you want to be - the writer - and then there's this weird other life of going on tour and talking about the writing. And that really is weird. I'm quite happy trekking around Greenland on my own, but those big book tours in America or the far east are the only time I ever really feel lonely. I take my toy wolf with me in my hand luggage." Paver is renowned for her work ethic - "I just like to write," she says, simply - and although she intended to take off "months and months and go round Canada or something" after finishing Ghost Hunter, she actually managed about a week before getting started on a new book. Published this month, it's a ghost story set in the Arctic, Dark Matter. Surprisingly, it is for adults. "I've wanted to write a ghost story for years, and my main aim was to write the most frightening ghost story that I could think of," she explains. "I don't have children, so perhaps I was being overly protective, but as it got darker and darker as I was writing it, I thought this may not be for 10-year-olds . . ."
"Video games are often based on a classical quest format. That fits well with a fable," he told the AP. "The book is about the value of life, and in video games you can have a thousand lives. So I contrasted those two things." Michelle Paver has won the Guardian Children's Fiction Prize for Ghost Hunter, the sixth and final book in her Chronicles of Ancient Darkness series. "It's relatively rare for a book late in a series to win a major prize," Julia Eccleshare [chair of judges] said. "But the Chronicles of Ancient Darkness is such a towering achievement, as a whole as well as in terms of the individual books, that it was our unanimous choice." "It's hard to believe this is the first picture book award-winning husband and wife John Burningham and Helen Oxenbury have created together - but it's well worth the wait...."
"Mini Grey's beautifully illustrated story improves with each reading as the stranger's mission and legacy become more intriguing - is he good or bad? A lovely book to open up discussion with little ones who like a bit of depth to their bedtime reading." "Guy Parker-Rees's exuberant illustrations create a wildly funny setting for this rhyming adventure in which the disgruntled ants, left off L eopard's party picnic list, get their revenge with a spot of bottom biting..."
"Fear of the dark is always a popular theme for picture books and this delightful one tackles the problem by using the friendship between a duckling scared of the night and a baby owl scared of the daylight." In 1977, while attending graduate school, she had persuaded her teachers to let her write and illustrate a children's book as a school project, which RPG agreed to produce and sell. Still in print today, Hippos Go Berserk! was the first in a line of Boynton books, including a few for adults and others inspired by her own children. "When my son Devin was 3, every time he heard the word oops, he would laugh," she recalls. "So I wanted to write a book for him that would be filled with an oops repetition. I wrote and sketched out Blue Hat, Green Hat in about an hour. He still laughs at it--and he's now 25!" Other popular Boynton titles include Your Personal Penguin, Philadelphia Chickens and Blue Moo, all of which feature another Boynton venture: original music. She and composer Michael Ford wrote songs to accompany each book, and asked big stars, including B.B. King, Brian Wilson and Kevin Bacon, to record them. "It never stops being amazing that people say yes," she says. "You get giddy with those kinds of experiences." Boynton's latest book, Amazing Cows! Udder Absurdity for Children Ages 5 to Infinity, will hit shelves in November, and the title offers a clue to the popularity of all her projects: a whimsy that appeals to children and adults alike. "Parents are saying, 'My kid doesn't need books with pictures anymore,' " said Justin Chanda, the publisher of Simon & Schuster Books for Young Readers. "There's a real push with parents and schools to have kids start reading big-kid books earlier. We've accelerated the graduation rate out of picture books." Landy, from County Dublin, has just released the fifth book in the series, "Skulduggery Pleasant: Mortal Coil," which follows Pleasant and his teenage sidekick Valkyrie Cain as they try to protect a known killer from an unstoppable assassin. Turning his hand to children's books was quite a shift for Landy, who had written two films since being thrown out of art college, one about zombies called "Boy Eat Girls" and the other a thriller in which everyone dies called "Dead Bodies." [Gaiman's] explanation of how his fantastically creepy children's book Coraline came to be started with a line as sinister as any he's written: "Because Morgan DeFoire lied." DeFoire, the daughter of Gaiman's longtime agent Merrilee Heifetz, acted as a litmus test back when the manuscript was still thought unpublishable for a young audience. It was decided that if Morgan and her sister Emily could stand the book without being "traumatized," as Gaiman put it, Heifetz would reconsider consigning Coraline to the adult bin with all the other horror novels. The girls proved Gaiman right, listening with faces more eager than petrified, and the book went on to claim the loyalty of children around the world, winning two awards (a Hugo and Nebula) and a movie contract, before becoming a musical. At the off-Broadway premiere of the show, Gaiman learned what Morgan DeFoire, seated beside him, had really thought of Coraline. "I told her, 'You know, we kind of have you to thank for all this, because you weren't scared by it. And she said, 'Actually, I was terrified. But I wanted to know what happened next. I knew if I let anybody know I was scared, I wouldn't find out.'" HarperCollins Children's Books has signed a three-book deal with children's writer and illustrator Siân Pattenden for The Peppers, a new magic-themed series for pre-teen readers. The first book in the series, as yet untitled, will be released in February 2012. The Awful Tale of Agatha Bilke, the first title in Pattenden's earlier series, was shortlisted for three prizes, including the Sheffield Children's Book Award and the Glen Dimplex New Writers Award. First Interactive 3D Children's Book? Finland has published the world's first interactive 3D animation story book to offer children a brand new experience, according to Finnish media report Tuesday. The 3D animation story book for children is just like ordinary fairy books, only with some special small black squares in some pages of it to indicate the interactive 3D animation. Once the web camera faces toward a black square, 3D-animation cartoon figures and pictures will appear in computer screen. Paul Cookson and Carl Flint have released their latest book of illustrated poems as an eBook. 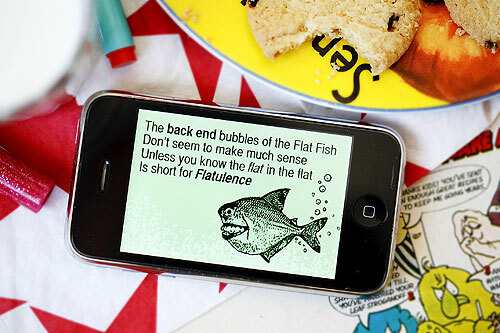 THE TOILET SEAT HAS TEETH is available from the iTunes App Store to download to your iPod Touch or iPhone. This eBook of short poems is aimed directly at children and takes full advantage of the 'cool' form factor of the Apple devices. This is the first time that Paul and Carl have worked together to produce something custom made for the iPhone. 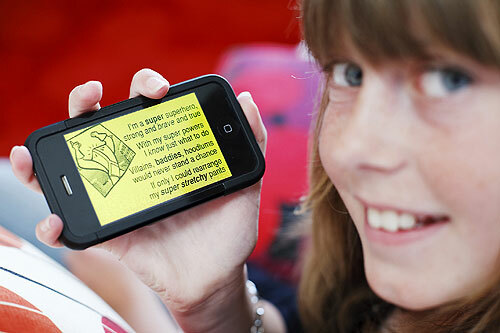 It is published by Sleepydog (www.sleepydog.net) who recognise the potential of emerging technologies such as the iPhone or iPod Touch to engage and encourage young readers in new and exciting ways. "This is a great idea! Anything that makes reading cool and gets kids reading for pleasure must be a good thing.'" Anthony Brown, Children's Laureate. THE TOILET SEAT HAS TEETH features a number of Paul Cookson's 'greatest hits' plus other brand new poems written especially for this format. In some cases, for example 'Getaway Pet', the pictures came first and inspired the poems that accompany them; the first time Paul and Carl have worked this way. "Often as a writer you work in isolation. But what was really inspiring with this project was using existing illustrations as starting points for the poems. Poems that would never have been written evolved thanks to this approach." Paul Cookson, poet. THE TOILET SEAT HAS TEETH includes an irreverent, interactive quiz to test kids' knowledge and comprehension of the material. It also features the creators' biographies in poetic form! while publishers were intrigued [by Clarice Bean], none was prepared to take a risk. "One said: 'You can't write a book for children in the first person, they don't understand it.' I knew that was rubbish. Another said: 'Either have lovely pictures and keep the text minimal, or keep the text and have simple drawings.' They all seemed to agree that I shouldn't have the text interrupting the pictures, as I do. But I thought, no: I'd rather it never got published than make radical changes. So I sat on it for a long time. That was very hard: I knew it was the best thing I'd ever done, and I thought, if no one wants this, I don't know what I can do." 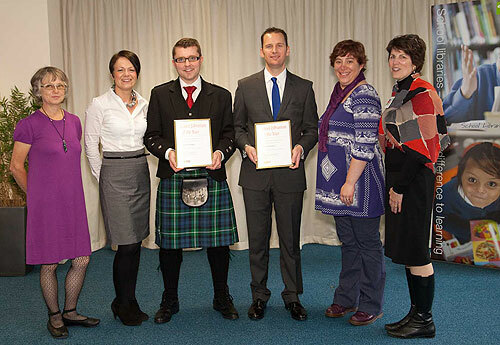 This year, for the first time, two people have been awarded the honour of the SLA School Librarian of the Year. Continue reading School Librarian of the Year Award. "I've always been aware that to be named after someone from the past carries with it all kinds of bittersweetness," explains Gleitzman. "I was named after my Jewish grandfather who left Poland early in the 20th century. What I knew from an early age was that he had lived most of his life in England, his Jewish wife had died and he married a non-Jewish woman who was my grandmother. And so the Jewishness was quite a distant part of my consciousness, as was the connection with Poland and the Holocaust." It became less distant after he stumbled across the biography of Janusz Korczak, a Polish Jewish doctor and children's author who helped run an orphanage for 200 Jewish children. My Name is Mina is a prequel to Almond's first novel, Skellig, published in 1998, but is also a standalone exploration of a child's relationship with language, ideas and living things, as expressed through the journal of a nine-year-old girl. "I could definitely write an eighth, ninth, tenth," the celebrated author, 45, told Oprah Winfrey during an interview scheduled to air Friday. "I'm not going to say I won't. I don't think I will ... I feel I am done, but you never know." Speaking in Edinburgh, where the interview took place, Rowling said she felt something of a loss upon finishing the saga's last installment,"Harry Potter and the Deathly Hallows." "It was a bereavement," she said.